Chamonix...birthplace of the sport of mountaineering, and an amazing destination for big mountain fun! The Mont Blanc massif looms over the town, with its dramatic aguilles, glaciers, and hanging seracs. Beautiful, foreboding alpine scenery. The sun was coming up, and the moon starting to set, as we crested the first of our three mountains. 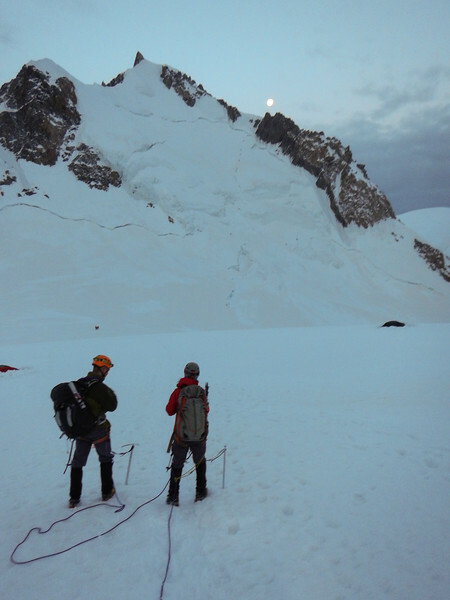 The next climbing section crested the Mont Maudit ridge, just to the left of the moon. That was the steepest section, with 50 degree alpine ice (thankfully, with fixed lines in place for protection).